First, I would like stress that I am not a spokesman for TB Joshua, neither am told to write my first article to counter Kayode Peter wrote titled. ”'HOW T.B. 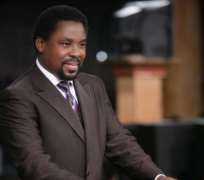 JOSHUA TOOK MY WIFE' – Pastor Peter Kayode tells it all” concerning Pastor T. B. Joshua of the Church of All Nations. Am an individual who love the ministry of Pastor TB Joshua of The Synagogue Church of All Nations (SCOAN) in Lagos, Nigeria. I do not seek to praise the man, but praise the God who is using him in such an extraordinary way to heal the broken-hearted, set the captives free and comfort those who mourn! And want the truth to be told. It's very sad that Kayode Peter of all people have chosen to defame his mentor Prophet TB Joshua in this manner. No one in this world can claim he or she has never had a problem or free form one of which he had his and l had mine. All am asking Kayode Peter is to say the truth, now that his no longer a Pastor in training but a Pastor of a Church. Kayode Peter want to know why l left Synagogue in 2003, Prophet TB Joshua has said many times during workers meeting “Many of you are here under protection, when your protection time is over and you leave you will see it clearly why God directed you here, they will be so blessed so long they make Gods word the standard for their life. 2. Many are here who will become Prophets, Pastors, and Evangelist, and some will become saboteurs and rebel against me 3. Many will become heads of departments and administration.” In my own case l told TB Joshua I want to go back to London and get married and he blessed to go; today am married and blessed with 2 kids with big online store in the UK. Today Kayode has turned in back on TB Joshua; saying dispeakerble things against him. WHAT BOUGHT ME TO GHANA My younger brother and l left London in 1991 in agreement with my father to use our family house known as Cedar House, now rented to KOALA at Dankwa Circle Accra as a Super market. At that time the building was been used by Kwatson. Unfortunately for me decided to use his money to set up a wine bar. This destabilized me as the capital l had was not enough for the renovation talks less of stocking the shop hence things became though. My auntie was in Ghana then, decided to lease it to Koala. I agreed since my capital will be given to me from the deposit paid by Koala. It became roller coaster of problems, so l decided to travel back to London via Nigeria, As God will have it, 6 days after l got to Nigeria plane fair was increased by former President Babangida by 100%, making thing even tighter. That was how l met TB Joshua, since then he has cared for as if l was his son. ON MY ROLE IN GHANA He stated that l never played any role in establishing the Church in Ghana; the truth is that in pursuit of greatness Kayode became a compulsive liar, he made sure he discredited everyone sent to Ghana to assist hence they as asked to return back to Lagos and he know it. TB Joshua gave him a long rope believing God can still change him. Finally I do know it's better for you to allow God to fight for you however, it's provoking when you know something in white and you are told it's cream or otherwise.